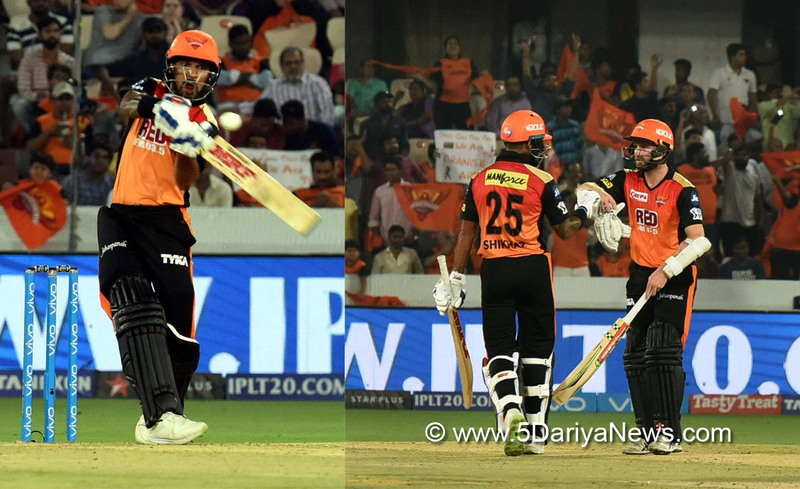 Brilliant batting from opener Shikhar Dhawan (77 not out) helped Sunrisers Hyderabad outplay Rajasthan Royals by nine wickets in the fourth match of the Indian Premier League (IPL) here on Monday.Right from the start, Dhawan, who slammed 13 boundaries and one six, made his intentions clear. Though Hyderabad started poorly, losing their opener Wriddhiman Saha (5), but after that there was no looking back as Dhawan and skipper Kane Williamson (36 not out) guided it to a comfortable victory with over four overs remaining .Williamson played 35 balls in smashed three boundaries and one six.For Rajasthan, pacer Jaydev Unadkat was the lone wicket taker.Earlier, Disciplined bowling helped Sunrisers Hyderabad restrict Rajasthan Royals to 125/9 in their allotted 20 overs.Apart from Sanju Samson (49), no other batsmen rose to the occasion and were dismissed one by one. For Hyderabad, pacer Sidharth Kaul and spinner Shakib al Hasan took two wickets each while Bhuvneshwar Kumar, Billy Stanlake and Rashid Khan chipped in one wicket each.Put in to bat, Rajasthan got off to a poor start as opener D Arcy Short (4) was departed on the last ball of the the first over. But after that wicket, new batsman Samson and opener Ajinkya Rahane (13) forged a crucial 46-run partnership to steady their team's ship.Just when things seemed good in the middle, Rahane was dismissed in the seventh over by Kaul. Unperturbed by the fall of skipper's wicket, Samson played freely, smashing the bad balls. Middle-order batsmen Ben Stokes (5), Rahul Tripathi (17) failed to utilise the start and were dismissed cheaply in the process.While trying to increase the run-rate, Samson was also dismissed by spinner Hasan in the 14th over. Samson played 42 balls and slammed five boundaries.Krishnappa Gowtham (0) was next to go. Kaul dismissed him in the 15th over.Jos Buttler (6) and Shreyas Gopal (18) then joined in the middle but the latter failed and departed in the 18th over. Gopal, however, tried to pace the innings but was sent packing in the last over by Bhuvneshwar Kumar.